The Luau is a Festival that takes place on the 11th of every Summer. 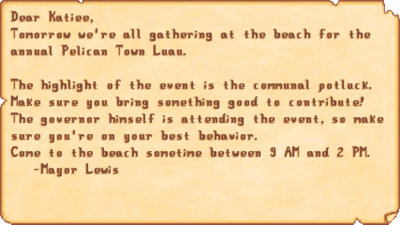 You attend the Luau by entering The Beach between 9am and 2pm. (You cannot enter the beach before 9am.) When the Luau ends, you will be returned to The Farm at 10pm. 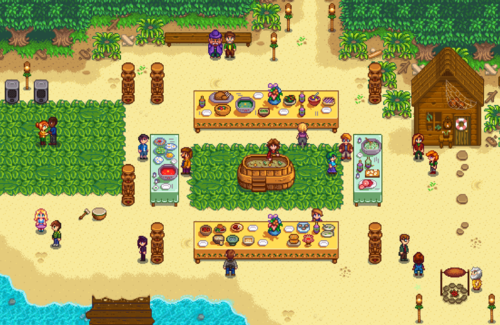 On the day of the Festival, every home and shop in Stardew Valley is "locked" and cannot be entered. A central feature of the Luau is the communal potluck soup, made with ingredients added by villagers. The player may choose to add an ingredient to the soup, then the Governor tastes and judges it. The soup-tasting begins by talking to Mayor Lewis and choosing "Yes, let's start." at the dialogue option. The reaction of the Governor at the soup tasting depends upon what item the player has added to it, if any. Friendship points with most villagers will also increase, decrease, or not change, depending on the item added to the soup. Friendships with Sandy, the Wizard, Krobus, and the Dwarf are never affected. When adding an item to the potluck soup, only edible, uncooked items are valid. (Although Life Elixir and Oil of Garlic are crafted and not cooked, the game considers them "cooked" items, so they are not eligible. Field Snack, however, is eligible.) Note that the game does not inform the player before the event that the "potluck" is a soup, nor that cooked or inedible items are not valid. Before the soup-tasting, Mayor Lewis states "I trust that you all put high-quality ingredients in the pot this year. We don't want the governor to regret his visit to the valley!" At this point it is too late for the player to change the item already added to the soup. Note that item quality, base sell price, and edibility (healing effect) are the three determining factors of the Governor's reaction. Profession bonuses that increase the sell price of items (such as Rancher, Angler, etc.) are not considered in the game's calculations. There are 6 possible outcomes depending on the item added to the soup (if any). The player neither earns nor loses friendship with the villagers if no item is used. In a multiplayer game, all players must add an item to the soup, or the "Missing Something" response will occur. The player earns 120 friendship points with the villagers if any of these items are used. In a multiplayer game, all players must add an item from the list below to achieve the "Best Response." Normal quality items are not eligible. *For items that are available in gold and iridium qualities, either may be used. The player earns 60 friendship points with the villagers if any of these items are used. The player neither earns nor loses friendship with the villagers if any of these items are used. *Any available quality (silver, gold, or iridium) of these items will produce the Neutral Response. The player loses 50 friendship points with the villagers if any of these items are used. The Governor passes out and the player loses 100 friendship points with the villagers if any of these items are used. Adding Mayor Lewis' purple shorts to the soup will result in a unique response from the Governor and Lewis. Friendship with villagers is unaffected in this scenario. 1.3: All players in a multiplayer game can contribute to the soup. Mayor Lewis' shorts can be added to the soup. This page was last modified on 18 November 2018, at 18:21.